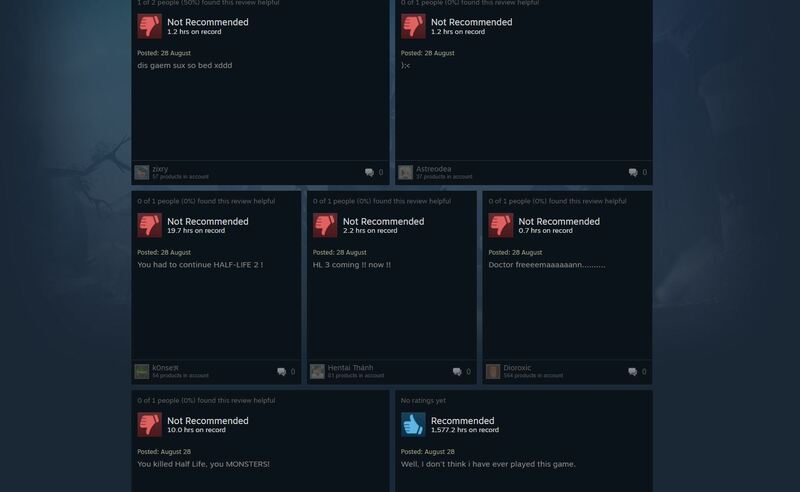 Steam users have suddenly started review-bombing Dota 2. Of course, there’s a reason behind this sudden influx of negative reviews. Last week, ex-Valve writer Marc Laidlaw, who had previously worked as a lead writer on Half-Life, posted a the entire plot of Episode 3 as he would have envisioned it. This made people realise how long it’s been since Episode 2 came out, and that they’re probably never getting another Half-Life. Perhaps as a way of venting frustrations, many started giving Dota 2 bad reviews (via PCGamesN) that don’t actually have anything to do with the game. You’ll see that most recent negative reviews have the worlds “half-life” somewhere, either lamenting the release of Episode 3 or the lack of a full-blown Half-Life sequel. Some have even decided to mention poor experiences with other Valve games, like Counter-Strike: Global Offensive. “Hl3? i think not,” wrote one. “I would really like this game, except it murdered one of my favourite games. Rest in peace half life, i loved you,” said another.